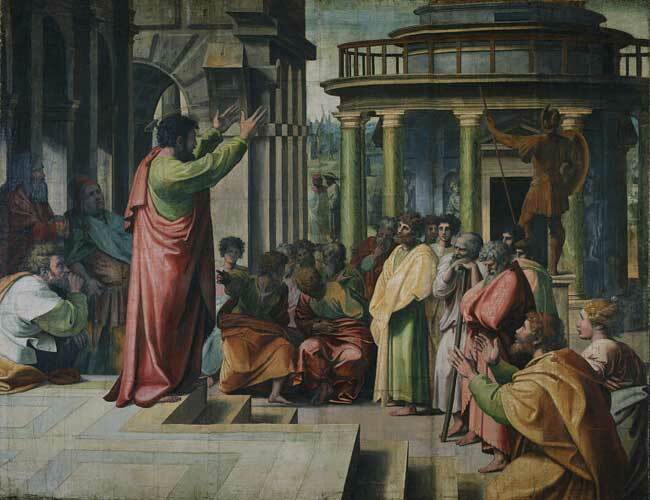 Paul is depicted with raised arms as he preaches on the immortality of the Soul. His audience is the assembled court of Athens, the Areopagus. The group of onlookers are shown in various stages of excitement as they listen to the teachings of the Apostle. This is particularly noticeable in the seated figures in the centre of the composition as they point and turn to discuss the virtues of Paul's message. In the background, with its back to the Apostle, is a statue of Mars standing in front of a circular temple. On the lower right of the cartoon, nearest the viewer, are the converts Dionysius and Damaris who kneel in wonder as they are enlightened by Paul's words. The tapestry was not among the seven displayed in the Sistine Chapel on 26th December 1519. 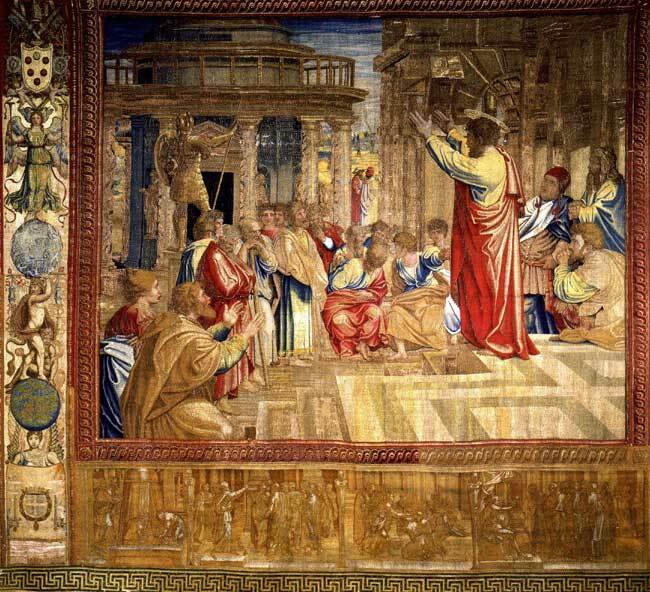 Along with The Conversion of Saul, the tapestry was stolen after the sack of Rome in 1527. Both works were returned to the Vatican in 1554. The Miraculous Draught of Fishes. The Healing of the Lame Man. The Conversion of the Proconsul.